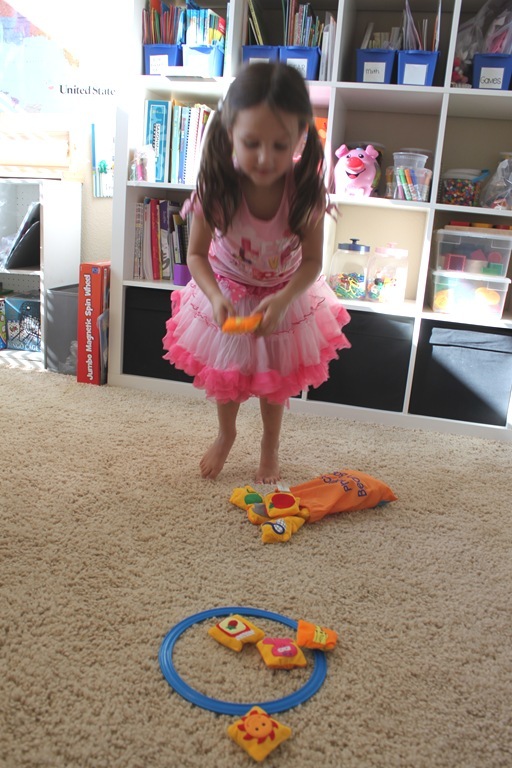 Looking for a fun way to practice phonics with your preschooler? You’ll love the Phonics Bean Bags by Educational Insights! What are Phonics Bean Bags? They’re really fun double sided bean bags. One side has short vowels and the other has long, the set also includes c and g to show hard and soft sounds. There are 26 bean bags total and the feature cute embroidered images on each bag. They come with a draw-string storage bag and the best part in my opinion…they’re washable! Hooray! I busted out some of plastic disks that I had and used them as ‘goals’. Then I let her pull a bag out, tell me if it used the long or short vowel, and what the beginning letter was. 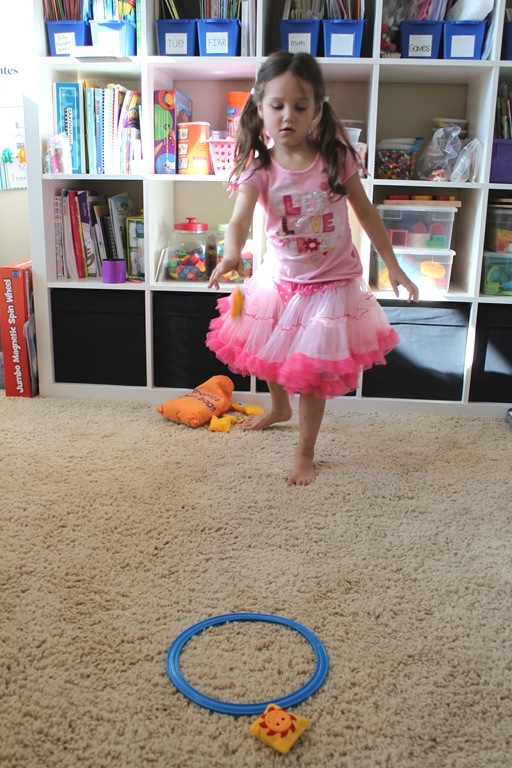 Then if she got it right she got to toss it into a hoop. The blue one was for short vowels an the red one was long vowels. Download my LOTW large floor Letters, then lay out the vowels on the floor and have your child toss the bag on the correct vowel sound. Use the LOTW Large Floor Letters consonants, then have your child toss the bags on to the correct consonant for the beginning sound of each item. Get a large piece of poster board, cut 5 holes in it, then write the one vowel on top of each hole. Have your student try to toss the bag through the correct hole. Take turns choosing a bag, then try to act out the image on the bag. 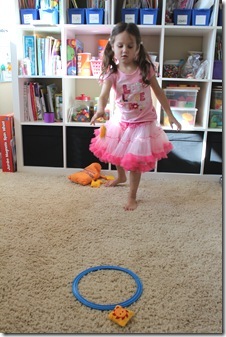 Play Bean Bag “Hot Potato”. 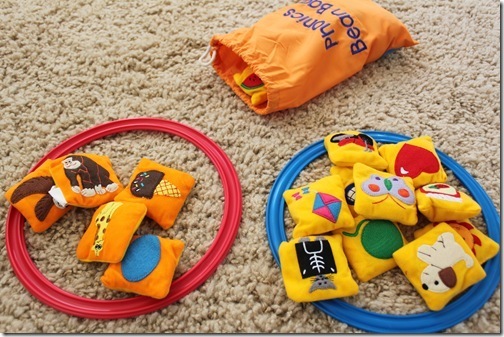 Sit all your students in a circle and play music while passing the bag around. Once the music stops whoever has the bag has to say the beginning sound and vowel. 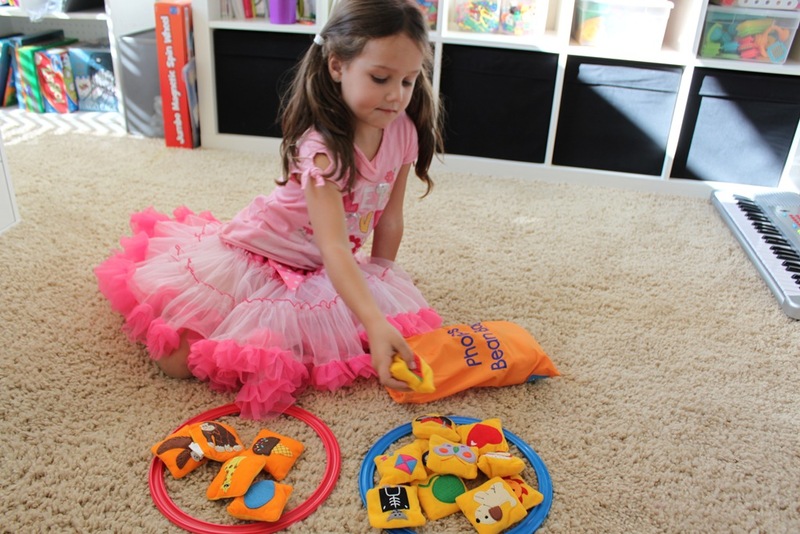 Play “I Spy”: Place several bags on the floor, and then say “I Spy something that starts with /d/”. Then let your student try to figure out what bag you’re looking at. Spell and Tell: Set out 3 bean bags whose beginning sounds create a simple CVC word such as bat, apple, turtle. Then have your child try to figure out the mystery word using the first letter from each bag. Want more info on Educational Insights? Check them out below, make sure to let them know Erica @ Confessions sent you over! Would you like to win a set of these fun sets for your own family? I just happen to have a set to giveaway to one of you! Guaranteed to make learning more fun! Can’t wait? Click here to get your own Phonics Bean Bags! 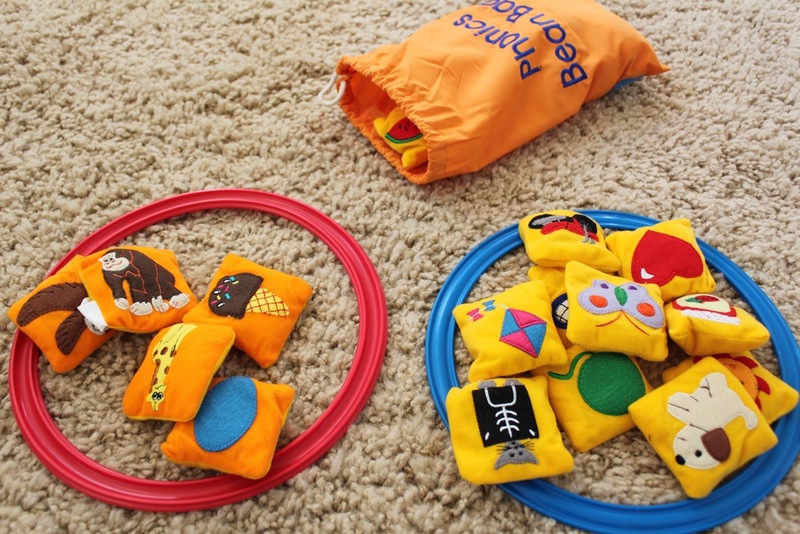 To win a FREE set of Phonics Bean Bags simply leave a comment below letting me know you’d like to win! “Like” Educational Insights on Facebook, then come back and leave a comment letting me know you did! Subscribe via email to Confessions! Subscribe via RSS to Confessions! The give away will be open until midnight EST Friday January 13, 2011. Winner will be announced by Sunday January 15, 2011. NOTE: giveaway is offered to US/Canada Residents Only. Disclosure: I was provided with a free game to view on my blog. The opinions I have given are mine and may differ from others but were not influenced by the company or the free product provided. Ooo – I want one! My five year old would love this game. This is exactly where she is at with phonics. Thanks for the giveaway! 2nd entry – we already subscribe to your email. Love it! Enter me please! Thanks! 2nd entry: Just subscribed via email. Thanks! These would be super fun to learn with! I’d LOVE to win these – how fun!